100 And Single: How The Hot 100 Became America's Hit Barometer : The Record After 55 years, the voracious creature, built to absorb whatever medium is delivering music to the masses at any given time, is complicated and imperfect — any chart where Bob Dylan, Bruce Springsteen and Missy Elliott peak only at No. 2 is — but it's still the best benchmark we have to measure the bigness of hits. Listen at the audio link to Chris Molanphy and NPR's Audie Cornish talk on All Things Considered about the history of Billboard's Hot 100 chart. Hear that? On the radio? That slick, dreamy crooner dude, singing about how he's going out of his mind over that girl? Well, she's an animal — baby, it's in her nature. He used to play around with hearts that hastened at his call. But when he met that little girl, he knew that he would fall. Wait a sec ... what song is this? Which dreamy dude is this? What year is this? Perhaps it's the first week of August, 1958, when the top song in America was Ricky Nelson's "Poor Little Fool" — the first No. 1 song ever on the Billboard Hot 100. The week Billboard launched what would become the premier singles chart in America, the list was led by the smooth-as-milk Nelson, acting the part of a player who'd met his match—bewitched by a woman who, it turns out, is even faster than he is. Fifty-five years later, to the week, we find the Hot 100 topped by "Blurred Lines," a ditty from the smooth-as-milk Robin Thicke. It's about a player who's ... bewitched by a woman who's faster than he is. The better question is this: How is it that, half a century later, we still follow a chart called the Hot 100 to measure which songs are dominating our earbuds, our streets, our beaches, our dancefloors, our American lives? We don't listen to transistor radios anymore, or buy seven-inch 45-RPM vinyl (not in quantity, anyway). Why is this chart still around? The Hot 100 was designed to adapt. It's a voracious creature, built to absorb whatever medium is delivering music to the masses at any given time. It's not perfect — any chart where Bob Dylan, Bruce Springsteen and Missy Elliott peak only at No. 2 can't be — but this chart, designed for the music business and followed by pop nerds like me worldwide, is still the best benchmark we have to measure the bigness of hits. Defining our terms: Before dissecting how the Hot 100 came to be the industry standard for pop hitography, let's answer some basic questions. 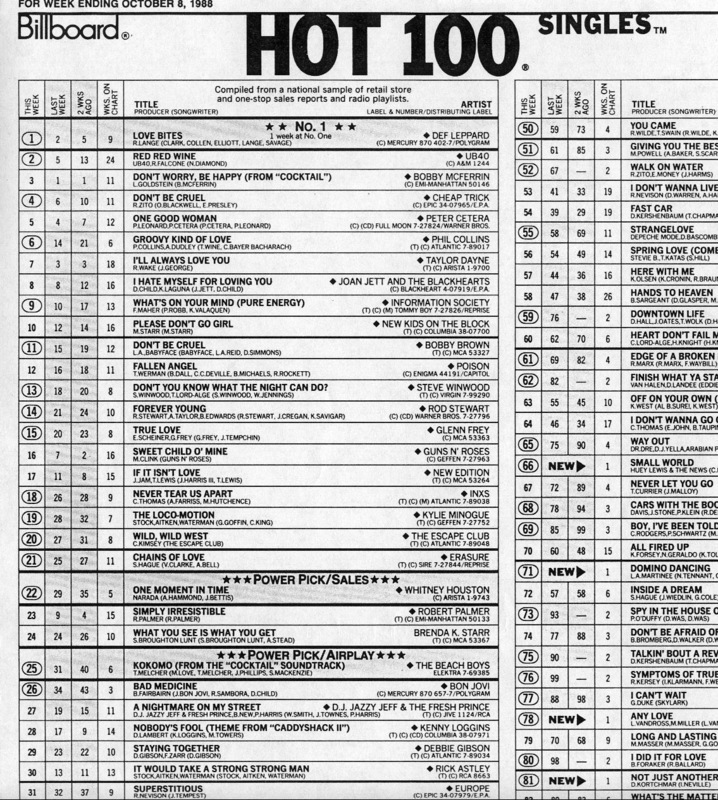 Virtually all music critics and chart historians referencing a "Top 40 hit" are talking about the Hot 100's first 40 positions, and if a song is understood to have "missed the Top 40," it peaked on the Hot 100 at No. 41 or below. This might all seem obvious — but it should be noted that many radio or TV programs that count down the top 40, top 20 or top 10 don't use the Hot 100. That's usually because the wide range of genres on Billboard's big chart are a little too wide for their tastes, falling outside of a station's target demographics — an adult-pop station that doesn't play rap, for example. For more than 20 years (1970–91), the national syndicated program American Top 40 with Casey Kasem did actually count down the Top 40 of the Hot 100 (for Boomers and Gen-X pop nerds, it was paradise). 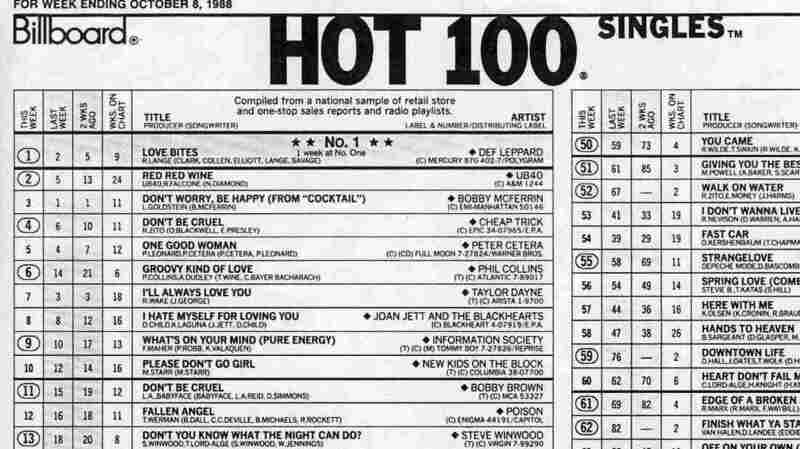 But after a 1991 host change, and in response to longtime station complaints about the edgier hits making the chart (e.g., "Me So Horny"), AT40 switched to other, more radio-centric charts for its data. The current edition of AT40, hosted by Ryan Seacrest, uses an unpublished chart with no direct relationship to Billboard. Is the Hot 100 a "pop" chart? While the term began as an abbreviation for "popular," pop has also come to denote a sugary genre unto itself — catchy music, usually meant to appeal to young people, tailor-made for the radio and mass consumption. But when we refer to the Hot 100 as "the big pop chart," pop really does mean popular: Billboard will allow onto the Hot 100 any current song, in any genre, that radio is playing or people are buying or streaming. R&B, rap, country, rock, dance and other genres all have their own separate charts, with rules limiting what kind of song is allowed there. But songs of all of these types can and do appear on the Hot 100. At one time, Billboard got its radio data for the Hot 100 only from stations playing Top 40 music. That's because, in its '60s-to-'80s heyday, Top 40 stations really would play a rock song next to a country song next to an R&B song. In our modern world of micro-audience, that's no longer the case, and the Hot 100 reflects it: For roughly the last 15 years, all current-based radio stations (i.e., not classic rock or oldies) feed into the chart. If your local hip-hop or alt-rock or adult-contemporary or hot-country station is playing current stuff, those plays are tracked on the Hot 100. However, it should be noted that, for both record-keeping and magazine-selling purposes, Billboard stamps its charts with a date in the future, even though the data is from the recent past. This skews timing considerably — there's a huge gap between when data is collected for the chart and the week-ending date. You buying a song or hearing it on the radio on a Monday or Tuesday doesn't get recorded until early the next week; it isn't announced by Billboard until a couple of days after that; it doesn't hit newsstands until early the following week; and its "week ending" date is the Saturday after that. So for example, any iTunes-buying or radio-listening you're doing right now is going to get captured on a chart dated August 17, 2013. What does "Number One with a bullet" mean? This phrase has so infiltrated popular culture that few know it originated in Billboard; and even those that know "with a bullet" is pop-chart-related have no idea why we're talking about ammo. It's actually pretty simple: Billboard puts a circle — a bullet — around the chart position of any record that is gaining in chart points and has upward momentum. The Hot 100 was the first major Billboard chart to receive bullets (at first, in the late '50s, they were actually stars, denoting a "Star Performer This Week"), but now virtually all Billboard charts have bullets. Generally, a song retains its bullet while it's rising and loses it when the song is slowing at radio or with consumers and, hence, nearing its peak. It's possible for a song to rise a few positions without a bullet, or fall a couple of places with a bullet — but generally, you want a bullet, which means your record has an upward trajectory. The ever-popular "No. 1 with a bullet" means a record is not only on top of the chart, it's got upward momentum and will likely stay there for a while since it can't go any higher. So that's a glossary of Hot 100 concepts. But how does the chart actually work? Radio and sales, the perfect blend: The main thing to keep in mind about the Hot 100 is that it doesn't measure just one thing. That is its genius. A bit of history: By 1955, at the start of the Rock Era, The Billboard, as the magazine was then called, had been tracking the amusements business (circuses, vaudeville, fairgrounds) for decades; and it had been tracking record sales for the better part of 20 years. At the time, the magazine ran separate charts that tracked best-selling records in stores, disc jockey playlists and jukebox plays (self-reported by retailers, DJs and jukebox operators, respectively, back in those pre-computer days). But the magazine's brain trust began experimenting with a chart that would mash up all of these pools of music data into one chart to rule them all. After three years of tinkering with a proto-chart (the "Top 100," 1955–58), on August 4, 1958, they launched the Hot 100 with great fanfare as the "first true blend" of sales-plus-plays. Radio is a more passive, top-down medium. It is certainly responsive to listener requests, but it's also driven by the demands of advertisers and the limits of formatting. However, radio is — still — how tens of millions of Americans are exposed to current music, which makes it valuable to track. Music retail, on the other hand, provides a better, more direct line into what songs consumers are obsessing over in any given week. But record retail over-samples the most obsessive fan (the one guaranteed to buy an Elvis single or a Madonna single in its first week), and it can be driven by momentary fads or short-lived event recordings. It should be noted that, while radio and retail are still the two biggest components of the Hot 100, they're not the only ones — other digital media like YouTube and Spotify now play a role in what makes a hit, too. Never mind the fact that "retail," nowadays, largely means iTunes, not record stores. Let's talk about how the big chart has evolved. Rules are made to be broken: The Hot 100 has been retooled frequently throughout its history. Arguably, this is what has prolonged the chart's life — Billboard has added new data streams or even changed the chart's ground rules when necessary. Most of the changes have had to do with the consumer side of the equation, reflecting changing norms in the ways fans buy songs, are permitted to acquire songs or have songs made available to them. The album chart changed first, switching to SoundScan data in May of that year. In November, SoundScan came to the Hot 100, along with radio data from Broadcast Data Systems — computerized counting of song plays, to match SoundScan's computerized tallying of sales. The result was a radically different Hot 100. Songs could now break faster — no more waiting weeks for retailers and programmers to acknowledge them — but they also lingered longer, both on the Hot 100 as a whole and at No. 1. Numerous all-time records were broken: Elvis's record for most weeks at No. 1 (11, with 1956's "Don't Be Cruel"/"Hound Dog") was beaten four times within the new chart's first five years (and finally set for all time in 1995–96 with Mariah Carey and Boyz II Men's 16-week blockbuster "One Sweet Day"). The Hot 100's first-ever song to debut at No. 1 appeared in 1995 (Michael Jackson's "You Are Not Alone"), and another 20 songs since then have repeated the feat. February 2005 — the addition of digital sales: Singles fans have Apple founder Steve Jobs to thank for the return of the a la carte song purchase. The legal-digital-music era began in earnest in 2003 when Apple launched the iTunes Music Store, with a uniform price of 99 cents per song and a requirement (insisted upon by Jobs in his negotiations with the labels) that virtually all songs be available for individual purchase. Two years later, with digital music booming, Billboard responded in kind, adding digital song sales to the Hot 100. In effect, the addition of iTunes and other digital song retailers proved a vital counterweight to the 1998 rule change allowing radio-only tracks on the chart. After a half-decade of sluggish Hot 100 action (e.g., only nine new songs hit No. 1 in all of 2002), the digital infusion energized the chart considerably. Consumers' tastes change faster than radio playlists, and consumers' ability to satisfy song cravings instantly — faster, even, than in the heyday of the 45-RPM single — allowed songs to make huge debuts and quantum leaps up the chart. Digital music even shifted the kinds of songs that would chart, in a more centrist-pop direction. No. 1 hits by the likes of Gwen Stefani, Plain White T's and Owl City would have been unthinkable without the viral effect spurred by iTunes. Of course, when it came to viral hits, iTunes wasn't the last word. March 2012/February 2013 — the addition of streaming music: Over the last 18 months the Hot 100 has begun to reckon with the world of digital music that fans play on demand but never acquire. Billboard's opening gambit came in the early spring of 2012, when it added Spotify and other subscription streaming music services (e.g., Muve Music, Rdio, Rhapsody, Slacker) to the chart. The effects were noticeable but not earth-shaking — a few more rock-oriented or EDM songs, such as fun. 's "We Are Young" or Avicii's "Levels," got a bit of a boost from on-demand streams, but not enough to shift the chart's direction. The bigger change came just this past winter, when YouTube and other video streaming was finally added to the Hot 100. This latest move by Billboard was exceedingly populist — not only are plays of official, label-sanctioned videos on Vevo now chart-legal, but YouTube fan videos incorporating at least half a minute of a current song count, as well. In a bit of clever P.R., Billboard introduced the change at a moment it wouldn't be missed, when the "Harlem Shake" phenomenon was dominating YouTube. The result: Baauer, producer of the "Harlem Shake" recording, became an instant Hot 100 chart-topper, as streams of some 100 million views (most of them of viral fan videos, not the full-length song itself) leapfrogged "Shake" to the penthouse. Six months later, Baauer still hasn't scored a followup hit, and worries by chart fans that the Hot 100 would become choked with viral dance fads have not yet come to pass. But we'll see what happens when the next music mega-meme explodes. The result of all these changes is that the Hot 100 is now essentially a three-legged stool. Sales and airplay are the first two legs, as they have been historically (albeit with digital sales now standing in for the 45); and streaming music — the combination of YouTube, Spotify and their ilk — is the third. According to Billboard, the formula continues to weigh sales and airplay more heavily than streaming. But in a week where streaming activity is high (read: a "Harlem Shake"–like phenomenon, or the release of a buzzy video like Miley Cyrus' "We Can't Stop"), the streaming component can make up as much as 30% of the Hot 100's data. How much longer can the Hot 100 remain relevant? In a world of music disaggregation and fan-driven hitmaking, won't the chart become a relic? It's certainly possible. But Billboard's malleable formula is a remarkably versatile tool, helping this Lazarus-like chart survive numerous paradigm shifts in the last two decades. In a world of adapt or die, as long as there's a music business to track, the Hot 100 can — and, I would argue, should — continue to exist, if only to maintain a benchmark with decades of history. Plus, let's just say it: Pop charts are fun. Who doesn't want an authoritative answer to the question, "What's No. 1 in the USA this week?"